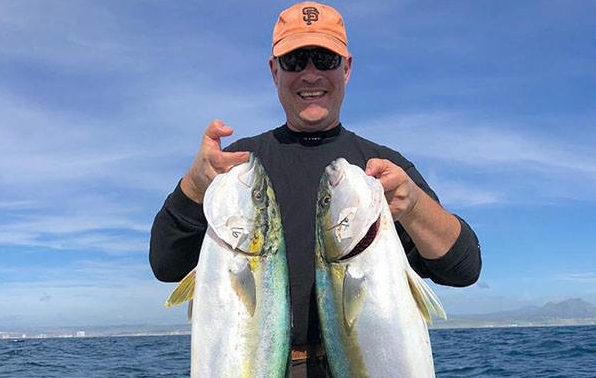 SAN DIEGO—The long awaited arrival of spring has brought Southern California saltwater anglers improved weather and improved surface fishing, with yellowtail biting in a few different areas around Los Coronado Islands and along the San Diego County coast. There has also been a chance at scratching out a yellowtail or white sea bass at Catalina Island. Los Coronado Islands have been the best for yellowtail and the current productive areas are the weather side of North Island, the hard bottom to the north and the northeast of North Island and the Middle Grounds. The fish counts from boats fishing on full-day trips on March 31 starts with Mission Belle out of Point Loma Sportfishing. The 27 anglers aboard caught 71 yellowtails and 50 rockfish. Seaforth Sportfishing had San Diego fishing with 30 anglers who caught two yellowtails, six bonito, one halibut and 150 rockfish. H&M Landing had Grande fishing with 16 anglers who caught 11 yellowtails, five bonito and 50 rockfish. Fisherman’s Landing had Liberty fishing with 37 anglers who caught 59 yellowtails and 11 bonito. The yellowtail action around Los Coronado Islands has been found in a few different areas. One productive yellowtail zone has been fishing up and down the weather side of North Island. Another productive yellowtail zone has been the hard bottom into the north and northeast of North Island. The third productive yellowtail zone has been at the Middle Grounds. Most of the yellowtails biting in recent days have been in the 10- to 20-pound range. The yellowtail around Los Coronado Islands have been located by finding meter marks, sonar marks and spots of fish that are up on the surface under working birds. Once located, yellowtails have been biting on yo-yoed iron, surface iron, sardines fished on a dropper loop rig and flylined sardines. Productive yo-yo jig choices include Salas 6X, Salas 7X and Tady 4/0 sized jigs in blue and white, scrambled egg and sardine colors. For surface iron, productive choices include Tady 45’s and Salas 7X light jigs in blue and white, sardine and mint colors. In addition to the fishing for yellowtail and bonito around Los Coronado Islands, there has also been good fishing for rockfish. One of the best zones for rockfish has been at hard bottom areas to the north and northwest of North Island in 40 to 65 fathoms of water. Another productive rockfish zone has been while fishing the South Kelp Ridge below South Island in 25 to 40 fathoms of water. Anglers fishing along the San Diego County coast are also experiencing improving yellowtail bites. The best zone for a chance at a coastal yellowtail has been while fishing outside of the upper end of La Jolla. Additional areas where there has been yellowtail activity reported have been the Green Tank at Point Loma, the zone below the MLPA closure zone off the lower end of La Jolla, the area between Del Mar and South Carlsbad and outside of Oceanside. Most of the coastal yellowtail activity has been coming from stopping on meter marks, sonar marks or spots of working birds. There is a lot of bait reported up and down the coast and yellowtails are often located around the spots of bait. Once located, there has been some action to be had while using surface iron or yo-yo iron. There was also a recent report of a yellowtail being caught on a Hookup Bait plastic while fishing off La Jolla. Sardines and mackerel have also been productive for yellowtail when slow trolled, flylined or fished with a dropper loop rig. On March 31, I had a chance to talk with Capt. R.J. Hudson of the New Seaforth out of Seaforth Sportfishing while at the Fred Hall Show in Del Mar. Hudson said they started to see an increase in yellowtail activity in the La Jolla region about one week prior to our conversation. He said water conditions are looking good and there is mostly nice looking, clean water to be found up and down much of the San Diego County coast. In addition to a chance at a yellowtail, the coastal fishing has also been providing an occasional white sea bass or halibut along with good numbers of bass, sculpin, reds, whitefish and rockfish. Productive rockfish areas off the San Diego County coast include the International Reef, the Imperial Beach Pipeline, hard bottom areas in the region of the Whistler Buoy at Point Loma, the Point Loma Pipeline, the Green Tank, The 270 to the west of Mission Bay, the upper end of La Jolla, Del Mar, Solana Beach, Leucadia, South Carlsbad and Box Canyon. Capt. Joe Cacciola of Sea Star with Sea Star Sportfishing and the Oceanside Sea Center reported catches of reds have been the highlight, with red vermillion rockfish to 4+ pounds biting. He added there is an abundance of bait holding off the Oceanside coast. Hard bottom and structure areas have been best for the bass and sculpin with some of the most productive areas being the Imperial Beach Pipeline, the hard bottom to the north and northwest of Buoy #3 at Point Loma, the Point Loma Pipeline, the Green Tank, the Jetty Kelp outside of Mission Bay, the Variety Kelp area below the MLPA closure area at the lower end of La Jolla, the upper end of La Jolla, Del Mar, the Anderson and Buccaneer Pipelines, the artificial reefs outside of Oceanside and Box Canyon. Some of the most productive halibut areas include the sandy bottom near the Aliso Pipeline off South Laguna Beach, Box Canyon, the area outside of the Oceanside Pier, the sandy bottom off South Ponto Beach, the sandy bottom next to the structure of the sunken NEL Tower, the sandy bottom next to the structure of the Yukon Shipwreck, San Diego Bay and while fishing sandy bottom areas outside of the Imperial Beach Pier. There has been a very occasional white sea bass found biting in the La Jolla region with reports of some white sea bass activity being found off the upper end of La Jolla and below the MLPA closure zone below the lower end of La Jolla. Another zone where there has been a bit of white sea bass activity has been off the Green Tank at Point Loma. Look for a chance at scratching out a few squid for bait at night in these areas but overall, the bait fishing for squid remains slow. Up at Catalina, there has been some squid to be caught for bait at night off the V’s and outside of Ben Weston with the Ben Weston area tending to be the best. Catalina has been producing an occasional white sea bass or yellowtail but it has been scratchy fishing. Areas where occasional white sea bass or yellowtail activity has been reported just outside of the V’s, Salta Verde and the area between Ribbon Rock and West End. A prolonged stretch of good weather might help a lot in bringing more consistent white sea bass or yellowtail action. The spring fishing season is underway and the yellowtail bite is on the upswing with good mixed bag fishing for bass, sculpin, rockfish, whitefish and reds also in the early spring fishing picture. Keep on fishing and I hope to see you out on the water!